Zoila friendii, copyright S. & A. Nappo. Zoila is a genus of medium- to large-sized cowries currently restricted to coasts of Australia, though fossils indicate a wider distribution in the western Pacific in the past. Members of this genus are direct developers, without a planktonic larval stage (Meyer 2003). [BR05] Bouchet, P., & J.-P. Rocroi. 2005. Classification and nomenclator of gastropod families. Malacologia 47 (1-2): 1-397. [BC01] Boyko, C. B. & J. R. Cordeiro. 2001. Catalog of Recent type specimens in the Division of Invertebrate Zoology, American Museum of Natural History. V. Mollusca, part 2 (class Gastropoda [exclusive of Opisthobranchia and Pulmonata], with supplements to Gastropoda [Opisthobranchia], and Bivalvia). Bulletin of the American Museum of Natural History 262: 1-170. [M03] Meyer, C. P. 2003. 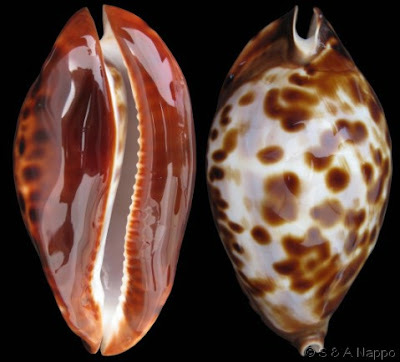 Molecular systematics of cowries (Gastropoda: Cypraeidae) and diversification patterns in the tropics. Biological Journal of the Linnean Society 79: 401-459.